what a fun card, Joan! 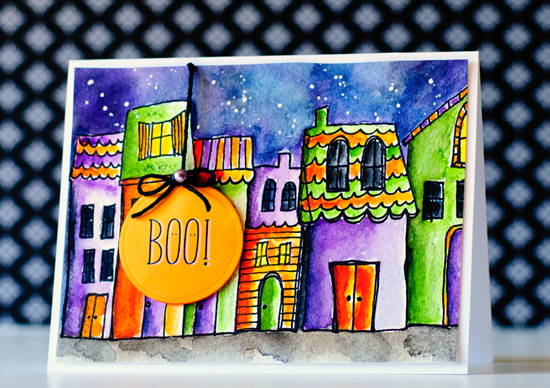 i love halloween cards and always make a bunch to send to friends and family!! Really fun! I love the colors and your watercoloring! Love this! Love, love, LOVE it! I know it's an overused word, but I mean it. 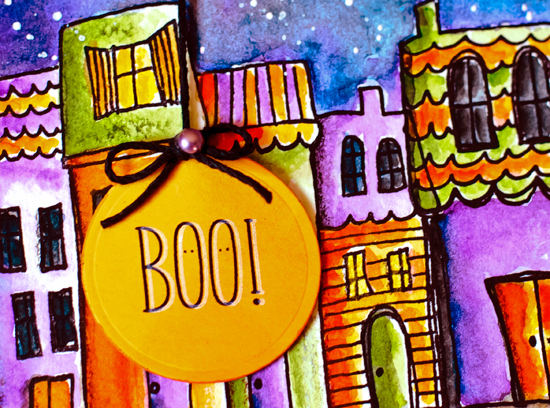 The Halloween colors are fabulous on these super cute houses. Your watercoloring is always top notch, Joan! Whenever I read 'retired' in your product description, I wonder if these are your returned supplies... it must be just like re-visiting an old friend ... with fabulous results, I might add. You sure caught on to water coloring! This is so fabulous -- all those wonderful [bright!] colors together!! I don't "do" Halloween, so I don't have any stamps either (well, just one after this week). But wow, now I know a work-around I can fall back on if it's necessary for some challenge. Joan, this is just gorgeous!! Said it on facebook and had to come see it BIG now too. Love the color combos you picked...that's where I'm challenged...oh, and painting like that too! :) Its awesome! What a wonderful, colorful card! Your painting is so vibrant and I love little houses in a row; yours look wonderful. I like the shadow behind the letters here too. Lots of awesomeness! I love this card! The bright Halloween colors are perfect. You could have drawn those houses yourself, you know. I enjoy making Halloween cards more than Christmas cards. If you need someone to send a Halloween card to, let me know and I will send along my address. I just love this card. Anything with bright colors makes me so happy. Thanks for sharing.